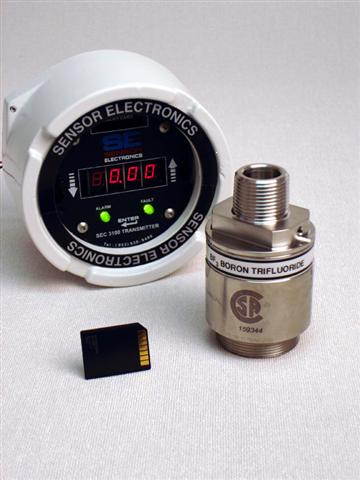 A sophisticated new gas-detection team that couples an SEC 3000 sensor with an SEC 3100 transmitter to “see” even traces of toxic gas concentrations has been announced by Sensor Electronics of Minneapolis. Engineered for semiconductor production areas where toxic gases like tungsten hexafluoride and dichlorosilane are an ever-present danger, this new sensor/transmitter team reacts instantly to dangerous gas levels. The factory-tuned sensor works in tandem with its digital transmitter, which incorporates a plug-in memory stick. Like an airliner’s black box, the memory stick logs a permanent record of actual gas levels, remembering times, concentrations, trouble signals, service interruptions and the like. The memory stick is easily pulled from the transmitter to download data to a computer for retrieval and analysis. The SEC 3100 transmitter shows actual gas levels – in PPM or per cent LEL – on a digital screen. Brilliant color-coded LEDs – change from green to yellow to red as gas concentrations rise, reverse colors as they drop. At a setpoint, integral relays can trigger alarms, turn on supply/exhaust fans, shut down lines, or whatever. The transmitter even keeps a beady eye on itself: The LEDs turn blue to warn of troubles anywhere in the system, and then the digital display spells out what’s wrong where. 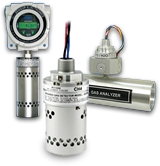 To switch gas sensors the transmitter needs no setup time, no reprogramming, and no recalibration. With an optional IS barrier, sensors can be changed without cutting system power. The sensor/transmitter pair shrug off temperature/humidity extremes (-40/160 degrees Fahrenheit, 0/99 per cent RH) and automatically compensate for wide temperature swings. The cylindrical stainless-steel sensor measures 2 inches diameter, 3 inches deep. The explosion-proof transmitter is 5 inches high/wide/deep. Sensors can be coupled directly to transmitters, or be up to 1000 feet apart. More information about this new toxic-gas detection team with a plug-in memory stick engineered for semiconductor production lines is available from Sensor Electronics, 5500 Lincoln Drive, Minneapolis, Minnesota 55436.